If an alien visitor from Mars commanded, “take me to your leading pig producing country” we would probably see spaceships landing in Tivoli Gardens in Copenhagen. That’s another way of saying that there are strong arguments for the Danish pig industry being the exemplar for the key metrics of global pig production and marketing in the 21st Century*. This is a strong statement especially when the FAO’s statistics list China, the USA, Germany, Spain, Brazil and Vietnam as the top six producers of pork. But efficiency is a relative concept: it’s about getting more from less. The Danes, by almost all measures, have consistently shown how more pigs and pigmeat can be produced from fewer inputs – and still meet modern (and future) norms for disease control, animal health, and the welfare of animals and the workforce on the farm and in the slaughterhouse. Moreover, their industry’s profile is younger, more knowledgeable and research-driven, and very customer (export) oriented. Those aliens will learn a lot by examining how the Danes produce pigs and pork. It’s undeniable that Danish pig farmers are world class when it comes to producing the highest number of surviving pigs from their breeding herd: the statistics are clear cut with an average performance for the Danish industry of 30.5 piglets weaned per sow per year. This productivity has meant that more and more pigs have been produced from fewer breeding sows over the years. And the Danes are so good at producing piglets that their farming neighbours in Germany are ready customers for weaners born in Denmark. More recently Polish farmers have discover ed that the Danes can produce healthy piglets at competitive prices and exports of live pigs Denmark to Poland have boomed. Danish farmers are generally younger, more innovative and more cooperative than others. They are also supported by a pig research organisation (owned and paid for by the farmers) that invests in work on genetics, animal welfare, antibiotic reduction and a myriad of other key topics that are vital for the future of pig production. Danish farmers (like all farmers) need an efficient, scaled-up processing industry beyond the farm gate and the Danish industry’s record of marketing and exporting its final product has also been exemplary. The major Danish processor (Danish Crown, one of the top three pigmeat processors in the world) is owned by the farmers themselves. Hence, Danish farmers have a big stake in their value chain and that value chain deals with approximately 2 million tonnes of pigmeat that is produced annually – and which creates almost 4 billion euros of exports. 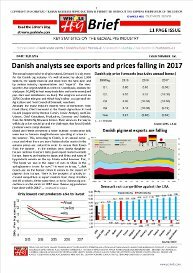 This export value accounts for about two thirds of all pigmeat produced by the Danes and, on that basis, Denmark can probably claim to be the most export oriented pig industry in the world. The alien from Mars might justifiably ask, how has a tiny country** on the north west tip of mainland Europe with no comparative advantage in feed production achieved this? We could answer this question by reference to the statistical handbook produced by the Danish Agriculture and Food Council. That would also be recommended reading for an alien visitor. However, perhaps another, more human way to answer the question, “how do they do it” is to visit the city of Herning in Jutland, Denmark. Herning was once synonymous with the textile trade – it was the place where the Danes made their clothes – but it is now the location for the annual congress of the Danish pig industry: the perfect place to meet the industry first-hand. About half of Denmark’s 3,800 pig farmers meet in Herning every October at the Herning Congress Centre and they are joined by experts and managers from the Danish Agriculture and Food Council and other organisations (you can read my report on the most recent Herning Congress in the October issue of Whole Hog Brief available in the on-line shop at www.porkinfo.com) . Over two days attendees at the Congress discuss about sixty different presentations on best practice in pig production – that’s a world class event in itself! The most recent meeting in Herning was in the third week of October 2016 and it provided a lot of useful information for me on the current and likely future, state of the Danish pig industry. The impression that the presentations and audience at Herning left this year was that the Danish industry is thirsty for knowledge and recognises new challenges but it is also one that is under pressure financially and, crucially, is changing and expecting to change. 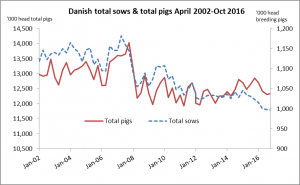 One example of change is the “growth panel” to increase the number of finishing pigs in Denmark. Around 19 million pigs were slaughtered in Denmark in 2015. 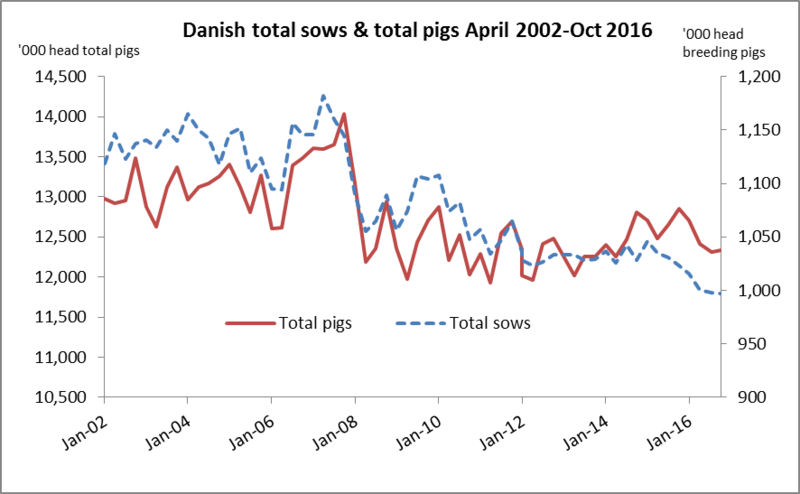 This is a modest increase from 2014, but that’s not enough pigs to keep Danish Crown running at full capacity. Too many pigs are being sold to Germany and Poland instead of being grown and finished in Denmark. SEGES, the Danish Pig Research Centre is developing specific initiatives to improve the financial results of finishing units, increase slaughter numbers and exports and create jobs within the pig industry in Denmark. It is also breaking new frontiers on antibiotic use (testing how to reduce antibiotic use to zero) and comparing which loose farrowing systems will work when sow stalls are eventually banned. An end to castration and tail docking are other key policies being researched by SEGES. Danish Crown and the new German owner (Tönnies) of the other, smaller Danish processor Tican were also at Herning. They were keen to lay out their stalls and to show Danish farmers how their different procurement systems would be better for their suppliers. So, is it all plain sailing for the Vikings – or will the alien visitor see weakness and threats to the Danish position? The answer to this is easy because the Danes themselves see challenges and dangers – the Herning congress had many examples of lively debate on this theme. For example, the growth of live exports is a two edged sword – it delivers revenues and profits to breeders (and Danish genetics suppliers) but is a threat to Danish processors and the whole industry is very vulnerable to the consequences of an outbreak of African Swine Fever or other pig disease that requires quarantine restrictions on the movement of pigs. Another challenge is the finite limit on the size of a sow’s uterus – can the Danes really continue to increase the number of piglets produced by a sow year after year? And will Danish Crown and Tönnies, two giants in the meat processing world, be able to coexist as their new strategies begin to bite? One thing is certain – the Danish industry will be here this time next year and we may even see flying saucers over Herning. Climate: temperate; humid and overcast; mild, windy winters and cool summers. Population: Approx. 6 million, nominally Roman Catholic with life expectancy of 78 years.